Starting with the Russell Tribunal in 1967, civil society tribunals have emerged to fill the normative vacuum created by the stark hypocrises of international justice. From States of Impunity. 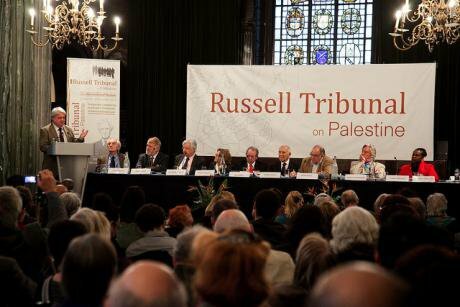 The London session of the Russell Tribunal on Palestine. Flickr/Tribunal Russell. Some rights reserved. After the second world war a legal and moral threshold was crossed. Leaders of Germany and Japan were held individually responsible for their contributions to state crimes committed by their governments in the course of the war. These trials in Nuremberg and Tokyo were heralded at the time as the start of a new era for the rule of law, which meant that political and military leaders could no longer benefit from impunity merely by covering their alleged criminality with a thick blanket of sovereignty, effectively placing their acts beyond legal scrutiny. From then on, it was naively supposed, there would be individual responsibility for political leaders and military commanders based on international criminal law, which was to be given precedence over any claims based on national sovereignty or the authority of domestic law. There was just one problem with this apparent step forward. It was only the crimes of the defeated countries that were prosecuted, while the crimes of the victors were totally disregarded. This meant that no legal responsibility was ever formally proposed for those who ordered the terror bombings of German and Japanese cities, with the express design of demoralizing their civilian populations. Even more prominently, this denied responsibility for those who carried out the atomic bombings of Hiroshima and Nagasaki, grossly indiscriminate with the overwhelming casualties and devastation associated with civilian society. Contrary to Justice Jackson’s high-minded expectations, the United States and its allies were quite prepared to live in the future with impunity for themselves and accountability for their adversaries. In recent years, such adversaries as Slobadan Milošević, Saddam Hussein and Muammar Qaddafi were all indicted for war crimes, while such western stalwarts as George W. Bush and Tony Blair were not even investigated for possible charges in relation to the initiation of an aggressive war against Iraq in 2003. It is against this background that citizens of conscience in civil society felt challenged by such a pattern of double standards that informed the approach adopted for even the most extreme instances of state crime. The first such challenge that aroused a populist response resulted in the mid-1960s from the American-led military intervention in Vietnam, the nature of which raised many serious allegations of state crime in relation to international uses of force. In this inflamed atmosphere, two celebrated philosophers and public intellectuals, Bertrand Russell and Jean-Paul Sartre, collaborated to convene a tribunal to assess testimony and documentary evidence of alleged war crimes associated with the Vietnam War. Two sessions were held in 1967, the first in Stockholm and the second in Roskilde, Denmark, with the specific intention of enabling people of conscience to act “against the crime of silence.” Russell served as the main sponsor of the event, including arranging the funding, while Sartre presided over a jury of conscience consisting of 25 globally prominent figures of moral authority, known for their intellectual and cultural contributions and association with progressive political causes. The judgment of what came to be known as the Russell Tribunal unanimously found the United States (and its allies) guilty of the array of crimes charged. At the time, this effort was widely attacked in mainstream circles as a one-sided ‘kangeroo court’ that had no formal authority and no legal competence, and was dismissed as a frivolous left-wing tactic to embarrass the United States in the midst of the cold war. More dispassionately viewed, the narrative compiled by the sessions of the Russell Tribunal did convincingly document the main charges brought against the United States, and thus did help fill a vacuum created by the failure to uphold the Nuremberg Promise made in 1945 by Justice Jackson. It was understood to be a symbolic initiative without technical legal credibility or enforcement capabilities. At the same time such an inquiry possessed a definite moral weight by confirming by evidence charges of criminal lawlessness, reinforcing public attitudes of opposition to the Vietnam war that were quite independently gaining political leverage at the time. Beyond this historical context created by the Vietnam War, the Russell experience did accomplish its purpose of speaking truth to power, and it established the viability and worth of such a symbolic undertaking. An influential Italian jurist and legislative member, Lelio Basso, inspired by this civil society experiment, moved to establish what at first was called ‘Russell II,’ but later became known as the Permanent Peoples’ Tribunal (PPT) headquartered in Rome. It developed a framework in the form of a Declaration of the Rights and Liberation of Peoples, and therefore positioned its various inquiries as people-oriented as distinct from the state-centric operation of the United Nations and other international institutions. Over the course of years since its founding in the 1970s, the PPT has organized more than 20 sessions of its tribunal, addressing such neglected international issues as military interventions in third-world countries, the rights of indigenous peoples in Brazil, the Marcos dictatorship in the Philippines, the predatory behavior of corporate capitalism under conditions of economic globalization, and the 1915 Armenian genocide. Many of the sessions resulted in published volumes that provided readers with a comprehensive and well-documented account of important issues that had been otherwise neglected or manipulated by governments and the UN. This model was also imitated and adapted to the particular outlook of the main organizers in a number of other unaffiliated settings. In 2000 a moving and quite influential peoples’ tribunal set up in Tokyo to inquire into the use of ‘comfort women’ by imperial Japan. Perhaps the most extensive and spontaneous of these civil society initiatives arose in response to the American-led invasion and occupation of Iraq in 2003. In different parts of the world, including in the United States, twenty preliminary sessions examined various allegations of criminality connected with the Iraq War, culminating in the 2005 Iraq War Tribunal in Istanbul at which 54 experts and witnesses testified. A distinguished jury assessed the charges and wrote a strong condemnation of the role played by the United States and the United Kingdom, as well as by corporations and private contractors. The Russell initiative also has endured through the work of the Russell Foundation that organizes civil society inquiries into state criminality in various controversial situations from its headquarters in Brussels. Recently, it has given primary attention to the Israel-Palestine conflict, organizing four sessions in different cities to explore the dimensions of war-crimes charges directed at Israel. These include examinations of the complicity of global corporations and criminal charges of apartheid associated with Israel’s occupation of Palestine and its discriminatory laws, policies and practices. Most recently, in September 2014, in response to the Israeli attack on Gaza, given the name Operation Protective Edge, the Russell Foundation convened an event in Brussels in which a jury of conscience listened to evidence, and particularly considered charges of ‘genocide’ put forward by critics of the attack. Many will consider this assessment of Protective Edge as without legal authority, and dismiss it as a biased undertaking that reaches predictable conclusions without bothering to take account of opposing arguments. As with the Russell initiatives in response to the Vietnam War, these civil society pronouncements have consistently encountered such harsh criticisms, and the Brussels initiative was no exception. It was dismissed as lacking in legal authority and failing to appreciate the situation facing Israel as a result of hundreds of Hamas rockets launched against its population. To put this argument in perspective, it is helpful to note that the UN has never acted to protect the people of Gaza or to challenge Israel’s legal entitlement to carry out a massive attack against an occupied people with no means of defense. It should also be observed that the Brussels Tribunal failed to uphold the most serious charge leveled against Israel in relation to Protective Edge, that the massive assault carried out against the defenseless civilian population of Gaza constituted genocide. On the basis of the evidence presented, the jury in Brussels did agree that Israel was guilty of the lesser crime of ‘Incitement to Genocide’ as set forth in Article 3(c) of the Genocide Convention. It also agreed that the additional treaty duty to prevent genocide had been definitely violated by Israeli behavior during Protective Edge. Unlike the original Russell Tribunal in relation to the Vietnam War, the initiative here to expose Israeli criminality was more a response to ‘indifference’ than to ‘silence,’ although in both instances the effort was made in light of the failures of organized international society to take steps to uphold the rule of law in a wartime situation. It is my view that such tribunals, created almost always in exceptional circumstances of defiance of the most elemental constraints of international law and morality, make crucial contributions to public awareness in situations where geopolitical realities preclude any reliance on established institutional procedures, such as recourse to the International Criminal Court and the UN Security Council and General Assembly. When strong interests of the west are at stake, as in the Ukraine, Kosovo, and Libya, there is no need to activate unofficial international law initiatives through the agency of civil society. However in circumstances such as the United States’ and most of western Europe’s unconditional support for Israel, the need for a public accounting is particularly urgent even if the prospects for achieving institutional accountability are virtually nil. The long suffering people of Gaza have endured three criminal assaults by Israel in the past six years, while the governments of the world looked on without lifting a finger. Under such circumstances, it is only civil society initiatives that respond meaningfully to the widely felt moral outrage, and provide reasoned views as to why such defiance of international criminal law is intolerable. The Russell tribunals, the PPT, and the various ad hoc civil society initiatives thus fill a normative vacuum in the world. Such undertakings do not pretend to be substitutes for courts of law. In fact, among the recommendations of the Brussels jury conclusions is a call on the Palestinian Authority to make use of the International Criminal Court, and present its grievance to the formal authorities in The Hague for their investigation and possible indictments. Even then the political realities of the world are such that prosecution would not be possible, as Israel is not a party to the treaty establishing the ICC and would certainly refuse to honor any arrest warrants issued in The Hague. No trial could proceed without the physical presence of those accused. As with the Nuremberg Judgment, flawed by victors’ justice, the various civil society initiatives of recent years can be criticized as being one-sided on behalf of the defeated and vulnerable in world society. Even admitting such a criticism, on balance I feel confident that these carefully analyzed assessments of geopolitically controversial wars and policies will be greatly valued in the future as contributions to the long struggle to make the rule of law applicable to the strong as well as the weak. In the spirit of transparency, I acknowledge that I was a member of the jury convened in Brussels. For other members see the website of the Russell Tribunal. The UN Human Rights Council has appointed a Commission of Inquiry to prepare a fact-finding report due in coming months, including policy recommendations, on state crime allegations directed at Israel and Hamas in the context of Protective Edge. On the basis of past experience it is highly unlikely that these finding will gain much more respect from governments and the UN than have prior efforts in the past, most notoriously the ‘Goldstone Report’ similarly commissioned after Cast Lead the earlier Israeli attack on Gaza in 2008-09.